The move is retroactive to June 16, making Jorge Soler eligible to return June 26. However, the Royals right fielder is expected to be sidelined considerably longer than that. KANSAS CITY, Mo. — Adalberto Mondesi is back with the Kansas City Royals as part of a roster shuffle. The Royals made six moves Sunday before playing Houston. Mondesi, the first player to make his major league debut in a World Series game, was recalled from Triple-A Omaha. The Royals also called up outfielder Rosell Herrera and purchased the contract of right-hander Wily Peralta from Omaha. They optioned right-hander Scott Barlow and infielder Ramon Torres to their Pacific Coast League affiliate. They transferred left-handed pitcher Eric Skoglund to the 60-day disabled list. Mondesi struck out as a pinch-hitter in the 2015 World Series against the New York Mets. He was once the Royals’ top prospect, but has been derailed by injuries and a 50-game drug suspension in 2016. 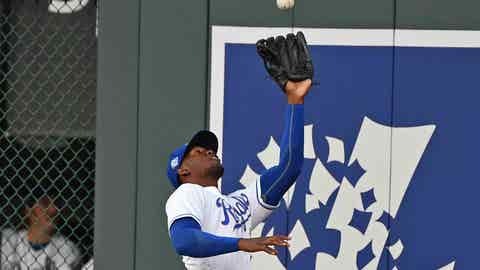 The 22-year-old opened the 2017 season as Kansas City’s starting second baseman, but was sent back to the minors after hitting .109 in his first 14 games. Mondesi, the son of former major league outfielder Raul Mondesi, has a .181 batting average with 60 strikeouts in 188 at-bats in 72 games in the majors. Yost said he plans to play Mondesi about four days a week. Mondesi hit .250 with 16 extra-base hits, 21 RBIs and 10 stolen bases in 29 games at Triple-A. The Royals claimed Herrera off waivers from Cincinnati on June 2. He hit .278 in 10 games with Omaha. He went 2 for 11 in 13 games earlier this season with the Reds. Peralta, a 17-game winner in 2014 with Milwaukee, signed with the Royals on December 5 as a free agent, but in spring training allowed 14 runs on 16 hits, including four home runs, and eight walks over eight innings. He began the year in the minors and posted a 4.37 ERA in 18 outings with Omaha, but had a 1.96 ERA on his last nine outings. “Our whole goal with (Brandon) Maurer and Peralta was to get them throwing good and get them back here. That has been the case,” Yost said.